Every handyman remembers buying a band saw as one of their first few tools when they were just beginning as DIY-ers. That is very understandable since band saws are very easy to use and are very versatile. You can use them for a wide variety of operations given that you know which blades to use for which job. Our goal in writing this review is to familiarize you with some of the best band saw blades on the market today and give you the information you need when shopping for blades. When we first heard about band saw blades, we thought they were like scissors. We thought we could get away with purchasing just one set of blades and use them for just about anything. We did notice that band saw blades came in different sizes, thicknesses, and fabrication types, for instance, but we thought those differences were negligible when it came to figuring out which blade to use for our work. The worst that could happen we figured was having broken blades due to using thin blades for cutting through thick materials. We could not have been more wrong. Apparently, the damage caused by using the wrong band saw blade type affects more than just the blade itself. You can end up making ugly cuts or damaging your workpiece altogether. We realized then that the different blade specs had different uses. Although the differences between one blade and another could be small, the impact could be major. Band saws are highly powerful. However, even the most expensive band saws with high-performance motors and high-end technical specs are useless if it is not used with the right band saw blade for the application it is used for. We just had to give the number one spot to DeWalt’s 3-pack band saw blade set because of how it effortlessly annihilates the competition across the board. These blades are made of premium steel that is designed and strengthened to let the blades cut through even the thickest and hardest steel. Despite being so powerful, the DW3984C set does not fail to make the smoothest cuts. It may be the most expensive band saw blade set in this list but we can’t complain. DeWalt gives you exactly what you pay for. 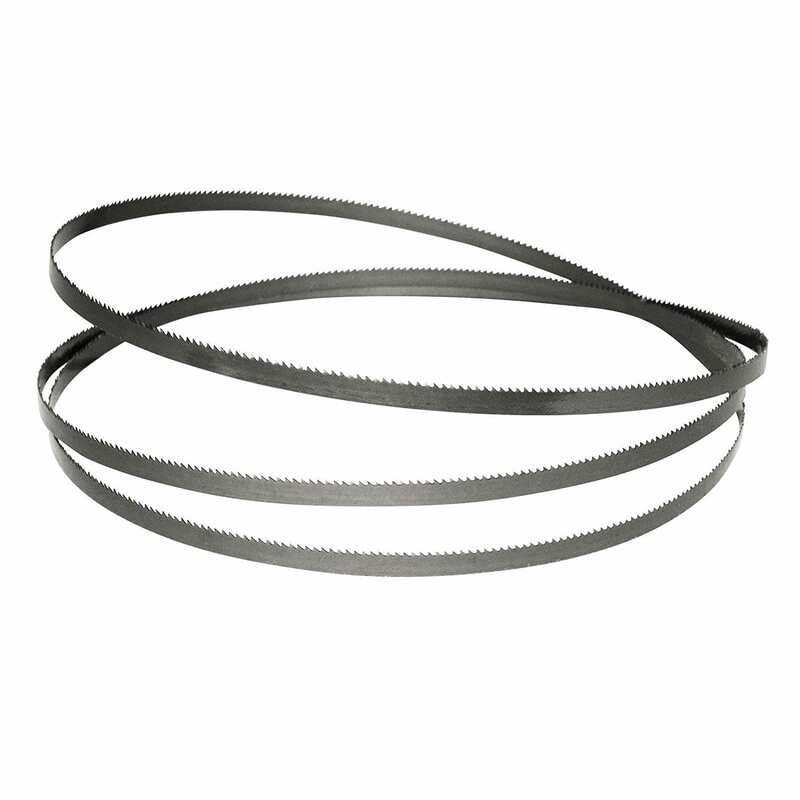 Closely following the DeWalt DW3984C is this metal cutting band saw blade set from Bosch. Intended for cutting the toughest metal materials, each blade is made of high-grade steel that can handle the most difficult cutting applications while withstanding extreme heat. It is also not picky, being compatible with most 9-inch and 10-inch band saws on the market. Although high-TPI blades such as the BS6412-24M (24 TPI) are often reserved for thin materials, Bosch’s blades can make nice and smooth cuts with that tooth density on nearly any material they are used for. Scroll cuts are difficult to make, and for the BS80-15S to nail that specific cut says a great deal about this band saw blade’s built and performance. It is made of high-quality steel that is engineered to enable it to attack even the most difficult scroll cuts without showing the slightest sign of stress. With impressive heat resistance properties, these band saw blades are sure to last a while and cut more than you thought it could. Contrary to what many think, band saws are not exclusively for contractors and the like. Woodworking hobbyists, craft lovers, and anyone else who wishes to take advantage of the band saw’s versatility in making round and irregular cuts should go out and get themselves a couple of blades right away. Armed with a powerful band saw and some high-grade blades, you can do a huge variety of applications from simple resetting of board faces and edges and book-matching to slightly complicated tasks such as making veneers, sawing thin or bent laminates, and processing small logs. Regardless of what exactly your business is with woodworking, a good band saw, and equally high-quality blades are almost never the wrong tools for the job. It can be difficult to select the right kind of band saw blades, what with the long list of models available in your local hardware alone. Take a look at the following factors to keep in mind the next time you go shopping for band saw blades. Also called the pitch, the TPI greatly affects the quality of the blade’s cut. The lower the TPI or, the lower the pitch (meaning, the fewer teeth it has), the more aggressively it cuts. That means it can cut a lot faster, but the cut will be rough. On the other hand, the higher the TPI or, the finer the pitch (more teeth), the cleaner and the smoother its cut is. However, it cuts relatively more slowly than blades with lower TPIs. Generally, the wider the blade, the stiffer it is. Wide blades are usually used in book-matching and making veneers and laminates because of their stability. Meanwhile, narrow blades are used where flexibility is necessary, like when cutting tight curves. When making round cuts, your desired cut radius serves as your guide in determining how wide your blade should be. If the cut radius is around 0.375 inch, your blade should be 0.19 inch wide at the most. On the other hand, a circle cut with a radius of 2.5 inches can be pulled off with a blade measuring up to 0.5 inch wide. The smaller the circle, the narrower the blade. Most of the time, narrow blades have more teeth compared to wide blades. This is because, to create a low-TPI blade, the blade has to be wide enough to accommodate larger gullets. 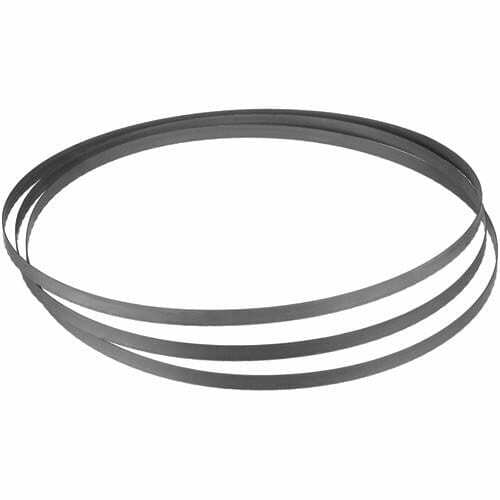 The most common materials used to fabricate band saw blades are hardened carbon steel (HCS), high-speed steel (HSS), bi-metal steel, and carbide tungsten. HSS and HCS blades are affordable and flexible. However, they are also relatively weak and do not last long. Carbide tungsten blades are extremely strong and durable. They last long despite being used for heavy-duty cutting on the thickest and hardest materials. This is why carbide blades are expensive. Lastly, bi-metal blades, which are made of both HCS and HSS, lie about in the middle in terms of price, strength, and longevity. The most common tooth shapes are hook, standard, raker, and skip. Hook-toothed blades are usually high-TPI and work for most band saw applications especially if speed is of paramount importance. The other tooth shapes mentioned often create smoother cut surfaces but do not cut quite as fast as the hook does. Longer blades are usually made thicker than shorter ones to keep them stable. As far as cutting itself is concerned, though, the kerf should not be much of an issue unless you are making a special cut. When making veneers or book-matching, for example, using a thinner blade means you get more layers out of your board. 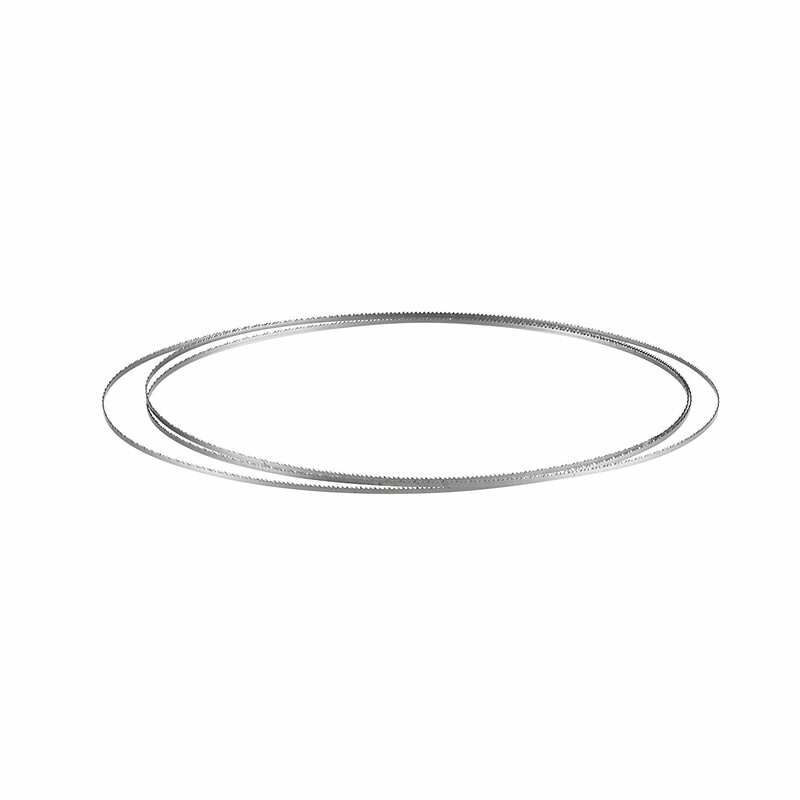 The Bosch BS6412-24M metal cutting band saw blade is made of premium steel that is reinforced to withstand the extreme heat levels produced during the cutting process. It can also handle high cutting speeds without showing the least sign of wear and tear. Although this blade is designed for cutting through metal, it is versatile and strong enough to be used on wood as well. The quality of the material used for the blade shows over time, as it manages to stay sharp even after a long time of use. Because of the material and the design of this blade, it can be used to smoothly cut through both thin and thick metals (and even wood). You can use it to make moderately tight curves and circles and anything else that requires smooth cut surfaces. Since the blade is engineered to hold up well against extreme heat, it can be used to cut at virtually any cutting speed. This expands the range of cutting operations you can do. You can make both rough and smooth cuts, and the blade will perform well each time. Although the DW3984C is made of HSS, DeWalt made sure their blade is nothing to sneer at. To be specific, this blade is made of Matrix II HSS Edge reinforced with 8% cobalt content. These enhancements make the blade strong and durable enough to cut through metals of various thicknesses and gauges and still manage to last a long while. It can also withstand heat and stress very well because of its alloy steel backer and Rc 65-67 tooth hardness rating. The special fabrication process and the cobalt content that went into this blade enable it to easily cut through thick and hard materials without breaking or getting dull right away. In fact, one of the benefits of the Matrix II HSS Edge is helping preserve the life of the blade and keeping its sharpness intact for a long time. 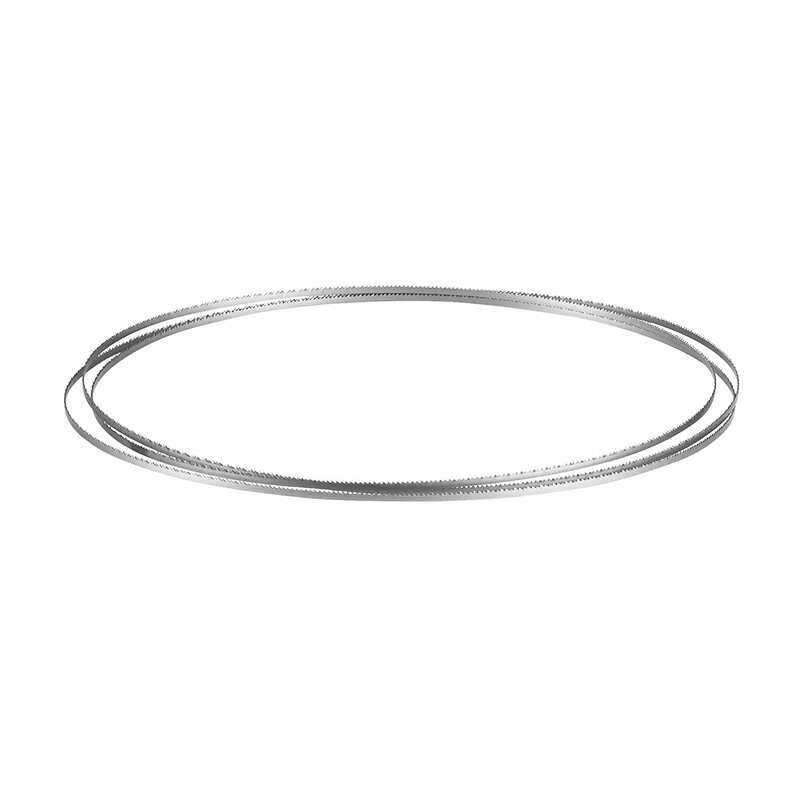 With 24 teeth per inch, the DW3984C can make the most delicate cuts that call for precision and smoothness. Although a low-TPI band saw blade cuts more slowly than high-pitch blades, the few additional seconds are a small price to pay for the impressive cut quality you will have in the end. Made of premium steel, the BS9312-15S is similar to other Bosch blades in that it performs nearly flawlessly. The tooth pattern on it is designed so that it makes fast cuts on even the thickest woods. The material and the construction of this blade enable it to pull off general purpose cutting, scroll cutting, and everything in between. This blade is also made extra strong against the extreme heat given off by the cutting process. Scroll cuts can be complicated and intricate. However, the BS9312-15S pulls it off nicely. That is because of the high-grade material and ingenious design that were applied to the making of this blade. Heat is one of the things that take a toll on a blade the earliest. It is a good thing that Bosch strengthened it enough to handle high heat levels. Not only does that help extend the life of your blade, but it also helps improve the quality of the cuts you make. Made of a single piece of high-carbon steel alloy, this blade from Powertec is guaranteed to make the toughest cuts without breaking. Since it is made of HCS and is designed to be very narrow, this blade is flexible enough to make tight curves and cuts in various materials such as hard and softwood varieties, plastics, and non-ferrous metals. Despite being so affordable, the 13132X has such a wide range of uses. It is also compatible with several band saw models from manufacturers such as Harbor Freight, Craftsman, and Masterforce. 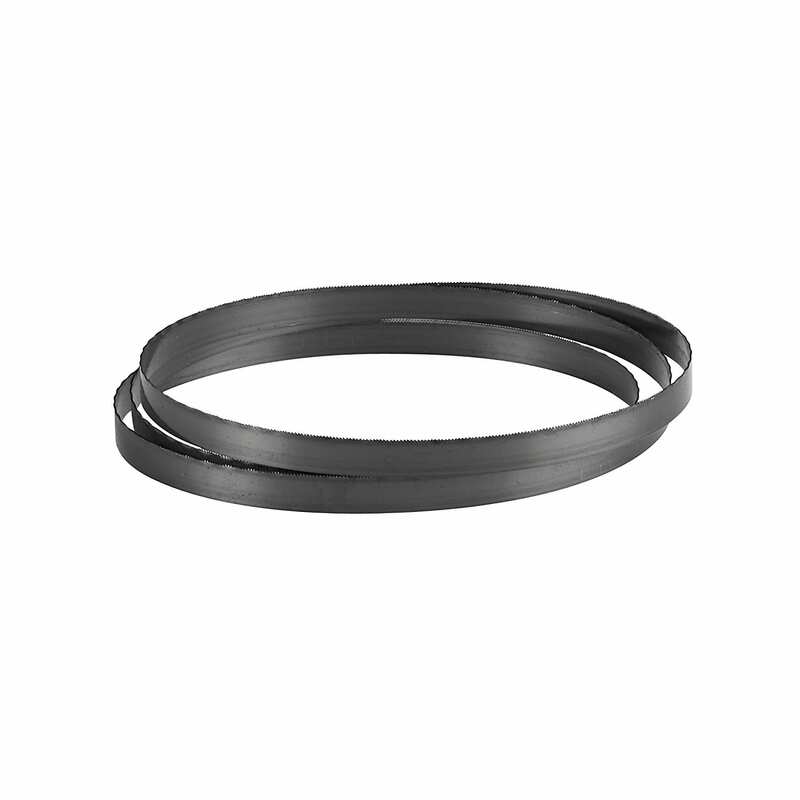 The 13132X fits Powertec’s BS900 9-inch band saw, as well as other models, like the following: Harbor Freight 96980 and 60500, Craftsman 21419, and Masterforce 2403731. This is important because you want your tools to be as universal as possible in the shop. Unless a blade can perform magic, you would not want to get it if it is compatible with only one or a few specific band saws. There are two things we like the most about how the 13132X is fabricated. First, it is made of HCS, which is known for its flexibility. Second, unlike other blades, the 13132X is cut out of a single sheet of steel, dramatically reducing the possibility of breakage while cutting. Bosch has always been a top brand in the area of tools and the BS80-15S, their take on stationary scroll cutting, only proves that even more. This blade is made of high-quality steel that can withstand heat when cutting wood or metal. Although the tooth design is specifically optimized for making scroll cuts, this blade will actually work just as fine for general purpose cutting as well. The relatively low TPI, meanwhile, can pull off fast cuts on any surface thickness. The good thing about a scroll cutting blade is that since it is designed to make such specialized cuts, it can surely handle general purpose cutting work too. Aside from being able to make delicate scroll patterns with this blade, you also get to keep it handy for many other operations. A blade with a pitch this low is good for making fast cuts on any material. However, do not expect it to produce smooth cut surfaces like high-TPI blades can. We had a hard time trying to find a recurring complaint with the blade. It seems as if most of the negative reviews are either about isolated cases that put product quality under a bad light or about other issues that the manufacturer had no control on. Many reviewers agree that DeWalt was able to squeeze in a lot of value for the money in this blade. It is affordable but it has that superior quality that DeWalt is known for. The BS72716 from Bosch can pull off pretty much any general cutting application in woods of varying thicknesses without being significantly affected by the heat. Since it is a low-pitch blade, it can slice through even dense wood varieties quickly. The cut may not be as smooth as those of higher-TPI blades, though. Finally, this blade is designed to be compatible with the most common band saw models. Bosch is one of the few manufacturers that really get scroll cutting blades right. The BS80-15S is able to make the most complicated scroll cuts without getting damaged by heat buildup. Its teeth are designed to maximize its cutting performance in both hard and soft wood materials. Meanwhile, since it fits with most other band saw models on the market today, you can use it with nearly any band saw and it will never fail to deliver. Made of premium Swedish steel using steel induction hardening technology, this mid-range blade from Timber Wolf is guaranteed to be tough enough to cut through nearly any material. We learned that Timber Wolf mills their blades’ teeth into a single strip steel section in order to create a sharp edge that can’t be achieved by simply stamping or grinding the teeth, like what other companies commonly do. Combining these two innovative manufacturing processes together, Timber Wolf assures us that their blades are designed to perform and last. What we love most about this blade from Makita is the fact that it is made of bi-metal construction, meaning it has the strengths of both HCS and HSS but not their weakness, which is longevity. Bi-metal is several times stronger and more durable compared to blades that are forged out of HCS or HSS alone. The 792556 can be used to cut both ferrous and non-ferrous materials up to 0.25 inches thick. The 4839-0551 is also a bi-metal blade, which means it is flexible enough to be used for moderately delicate operations and can withstand a lot of heat and wear and tear in the shop. It is so strong that you can use it to cut through materials up to 0.5 inch thick with most common band saw models available. This blade from MK Morse is compatible for most stationary band saw models available. It is made of “carbon hard edge flexible back material” with a tooth hardness rating of Rc 64-66. This makes the ZCFD14 extremely capable of cutting through dense and thick materials with ease. It has 14 teeth per inch, a number you would love to see if you are looking for a band saw blade that cuts faster than smoother. Using the right band saw blade is vital to making the best cuts while prolonging the life of your tools. The key to finding the right blade or blade set for your needs is understanding what blade measurements and other technical specs mean and how they affect the kind of cut that is made. You have to pay attention to widths, TPIs, steel, and other features because those are what determine what each blade is capable of doing.